Chlorine has long been associated with bleaching wood pulp but liquid oxygen is fast-becoming a popular alternative. The biggest reason for this change is traced to the environmental concerns associated with chlorine bleaching. When chlorine is used, the process produces many hazardous organic compounds leading to air and water pollution; oxygen is not associated with these same issues. As mills move towards total chlorine free (TCF) and elemental chlorine free (ECF) pulp production, liquid oxygen is making more and more business sense. Pulp must be bleached before it can be used to produce white paper. Impurities called lignin in the pulp are responsible for the discoloration and must be removed early in the paper making process. The use of liquid oxygen during this delignification process helps reduce the use of chlorine in later steps. Not only does this have environmental benefits, it benefits the health of mill workers, and results in fewer colors in the pulp effluent (waste). Because of this, the effluent from an oxygen bleaching system can be recycled back into the system and used again. In chlorine-based processes, the effluent cannot be recycled and instead goes into the wastewater treatment system. In addition to being less damaging to the environment and recyclable, oxygen is less expensive to use in the bleaching process than either chlorine dioxide or hydrogen peroxide. In this way, oxygen as a bleaching agent also helps to reduce overall production costs. The benefits of using oxygen in pulp production are undeniable but the gas has many more uses. Liquid oxygen can be used in welding, plasma cutting, and food packaging applications too. 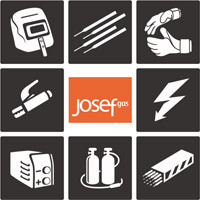 Whatever your industry, let Josef Gas ensure you have a continuous supply of oxygen available to meet your production demands. We offer both cylinder and bulk gas delivery to meet any need. Give us a call at 416.658.1212 to learn how we can help improve your bottom line.